Throughout the year, Zuiderdam migrates between the continents of the northern hemisphere. Spend the northern hemisphere’s summer exploring the cultural ports of Northern Europe. From May to August embark in Copenhagen to discover the Baltic states, Iceland and the UK. As the weather starts to cool, make your way across the Atlantic to North America. Witness the fall colours of Canada and New England from either New York or Quebec before Zuiderdam heads to the tropical Caribbean. If you’re looking to warm your toes in the tropical waters of the Caribbean, Zuiderdam has a number of fantastic itinerary options. Embark on the typical eastern Caribbean or western Caribbean discovery or cruise to the Southern Caribbean including a partial transit of the Panama Canal. 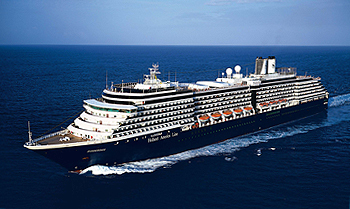 View all Zuiderdam cruises, view a selection of Holland America cruise deals, or view more options for Holland America cruises. Guests aboard Zuiderdam, the first in Holland America’s Vista-class series, enjoy a spectacular art and antique collection, wide teak decks, elegant dining rooms and spacious staterooms-many with verandahs. At the heart of Zuiderdam, suspended in a three-story atrium, is a Waterford Crystal Seahorse. Other notable pieces include a painting of Queen Beatrix by pop culture artist and icon, Andy Warhol, medallions by Frank Lloyd Wright, and a massive floral painting by Charles Ben. Zuiderdam guests enjoy dazzling entertainment options from their very first night on board. As part of the updates coming November 2017, two new music venues will be added: Lincoln Center Stage, featuring world-class musicians performing chamber music, and Billboard Onboard, rocking the house with 50 years of chart-topping hits. These venues will join the already popular B.B. King’s Blues Club, which brings the best of Memphis blues to sea, and completes our new “Music Walk” experience. We invite you to dine “As You Wish” To savor Italian cuisine one night and a perfectly grilled porterhouse steak the next. To take your place in the Dining Room at a specific seating time or be spontaneous, following your desires. On board, there are restaurants to suit every mood, along with the flexibility to choose the dining style you prefer. “Spartire” is the Italian word for sharing; our new menu is designed around this authentic Italian experience and offers a variety of dishes to enjoy and share with family and friends. Aboard the Eurodam and Nieuw Amsterdam, enjoy the Tamarind for food evoking the rich culinary traditions of Southeast Asian, China and Japan. The two-tiered Dining Room with its sea views, white linens, sparkling crystal and Rosenthal china, elevates each dining occasion. Whether you choose a pre-set seating and dining time or the freedom each evening to dine “As You Wish”. Choose the blissful pampering of a facial or let the trained fingers of a massage therapist soothe your muscles while working fragrant oils into your skin. Take a class in our professionally staffed Fitness Center equipped with the latest cardio and weight machines. On deck are basketball and volleyball courts and two refreshing pools. Designed exclusively for teens (13 – 17) to have fun, socialize and hang out with people their own age. Once you’re aboard Holland America’s Zuiderdam, you’re required to unwind and set your inner child free. During your ultimate cruising experience you’ll have the opportunity to wander around the decks and submerge yourself in whichever activity your heart desires. Feel free to let your hair down and kick your shoes off and absorb the serene atmosphere. Close your eyes and open your mind to all of the thrill seeking entertainment alternative that you’ll have the opportunity to venture. No matter how you plan on spending your night, the Zuiderdam remains well equipped to accommodate each and every one of your desires. If you’re looking for the relaxed scenery of a lounge, you’ll find plenty. If you’re in the mood for the mingling bar atmosphere, you’ll feel completely comfortable in our bars.